EINDHOVEN, THE NETHERLANDS--(Marketwired - Nov 8, 2013) - Will your next mobile phone have built-in stereo speakers? As handset makers focus increasingly on audio quality, consumers can look forward to phones and other mobile devices that achieve higher sound quality than ever before, without relying on headphones and accessories. With over 20 million first-generation speaker driver ICs shipped in the first 12 months, NXP Semiconductors (NASDAQ: NXPI) is now introducing the TFA9895 -- its second-generation speaker boost solution -- which further improves the sound quality of handsets and tablets via a new multi-band compression feature which enhances the way music and voice sound, even at louder speaker volumes. "Over the past year, we've seen a dramatic improvement in audio playback from phones, with exciting features such as front-facing speakers and even stereo available in leading handsets. Consumers now expect to enjoy audio and video without carrying accessories -- triggering a major reversal among handset makers who had traditionally relied on headphones and external speakers to satisfy audiophiles," said Shawn Scarlett, marketing director, mobile audio solutions, NXP Semiconductors. "With its new multi-band compression algorithm, our latest TFA9895 speaker boost solution helps handset designers get higher-quality sound out of smaller spaces -- and do so cost-effectively. 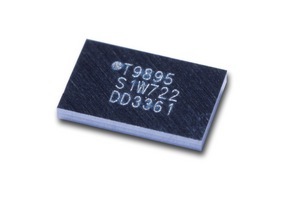 For devices where volume is the top priority, we continue to offer the higher-power TFA9890 introduced earlier this year." The multi-band processing feature in the TFA9895 improves audio quality at louder speaker volumes via more stable high-gain audio imaging. The TFA9895 also adds a high-frequency noise gate that improves the sound of poor-quality audio signals. Like its award-winning predecessor, the TFA9887, the TFA9895 offers a completely integrated small speaker driver, including integrated processing and an on-board 5-volt DC/DC converter, as well as complete protection against speaker failure. Both ICs can deliver 4 watts of peak power into a 4-ohm speaker that is conventionally limited to 0.5 W.
The new multi-band algorithm and noise-reduction features complement the existing speaker protection algorithm to provide high-quality sound from small speakers. The feedback-controlled excursion protection prevents distortion caused by hitting the mechanical limits of the speaker, and an advanced clip avoidance algorithm monitors audio performance and prevents amplifier clipping even when the power supply begins to sag. The system allows for bandwidth extension to increase the low frequency response well below speaker resonance. The device can be configured for stereo systems, allowing synchronization between devices to ensure good stereo imaging. NXP is the market leader in speaker boost and protection, with the only IC offering adaptive excursion control which provides real-time, real-world protection even when the acoustic environment changes. Systems using the TFA9895 or other NXP speaker boost amplifiers can greatly improve the sound from small speakers, typically realizing gains of 6 to 9 dB in output volume and 12 dB in bass response while also improving system reliability. Alternatively, designers can use the improved performance to further shrink their acoustic systems, resulting in smaller and thinner devices. As with the previous boost and protection ICs, the entire system is integrated into a single chip, including the CoolFlux DSP high-efficiency class-D amplifier with current sensing and DC-to-DC converter. The advanced, embedded algorithms require no separate licensing. Additional tools allow designers to customize their audio sound quality and choose how to optimize the phone's performance. NXP Semiconductors N.V. (NASDAQ: NXPI) creates solutions that enable secure connections for a smarter world. Building on its expertise in High Performance Mixed Signal electronics, NXP is driving innovation in the automotive, identification and mobile industries, and in application areas including wireless infrastructure, lighting, healthcare, industrial, consumer tech and computing. NXP has operations in more than 25 countries, and posted revenue of $4.36 billion in 2012. Find out more at www.nxp.com.